I go by the Big House every time I go home to see what the Valdosta Heritage Foundation has accomplished over the previous year. Sometimes I just drive by; sometimes I meet my Aunt Catherine there and go inside. This past March (2011) was different. 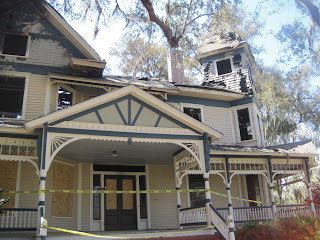 The Big House burned on January 26, 2011, and I was dreading seeing the damage. I had been in Valdosta for several days when I finally decided on a Saturday to go see the house. It helped that it was a beautiful (hot!) spring day---not a cloud in the sky. When I got out of the car, I didn't look up at the house at first. Peripheral vision made everything seem normal, and I wanted to savor it for a few minutes. 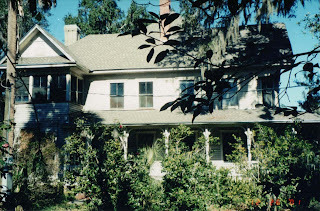 Then I looked toward the front of the house; things didn't look so bad, except that some of the windows were boarded up. I looked up to where the third floor attic should have been...it was gone. The house, in fact, was just a shell. I walked around the exterior of the house, taking photographs and trying to be objective about what I saw. I still just could not believe what had happened. The Big House in March 2011 after the January fire, looking at the southern end of the east elevation (front of the house) toward the living room on the first floor and the bedroom on the second floor where my grandmother, mother, and aunt slept. Looking at the east elevation (front of the house). March 2011. The boarded up windows keep us from seeing the extent of the damage of the first floor, but I was told that the interior was gutted. The above photograph was taken in 2001 before much of the restoration had begun. This is looking toward the tower that sits on the northeastern corner (the front of the house is to the left). The parlor is through the first floor window, and a bedroom is above. The above photograph is the same view as the previous one, taken in March 2011 after the January fire. The roof and attic are gone. At least the beautiful stained glass parlor window survived! Looking at the western end of the north elevation (side facing the neighbor), March 2011. The dining room window is in the center of the photograph on the first floor hiding behind the bushes, and the kitchen is to the right. You can see sky through the second story bedroom window. Oblique view of the north elevation and the kitchen of the Big House, March 2011 after the fire. A ramp for handicap access was added by the Valdosta Heritage Foundation. 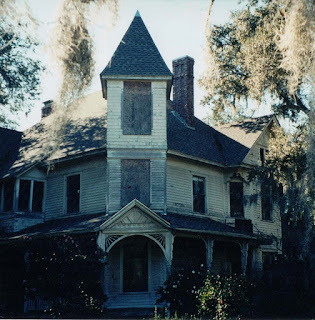 The Big House in 2001 before restoration was completely underway, looking at the west elevation (the back of the house). The kitchen is on the left, and a first floor bedroom is on the right. The back porch is in the center. The Big House in March 2011 after the January fire; same view as the above photograph. Notice the charred center of the house. The Big House in 2001 before restoration, looking at the south elevation (facing the side garden). On the first floor, the living room is to the right, a bedroom is in the center, and another bedroom is on the left. On the second story are the sleeping porch on the left, a bedroom in the center, and the bedroom where my grandmother, mother, and aunt slept on the right. The Big House in March 2011 after the January fire; same view as above photograph. You can see the gutted second story. The attic and roof are gone. Look at that beautiful blue Georgia sky! To show it's not all bad--the flowers in the Big House garden are still blooming. These are azaleas and wisteria. March 2011. A white camellia with just a glint of sun in the Big House garden. March 2011. I don't have any photographs of the Big House restoration between 2001 and 2011 (that I can find anyway). I didn't always take photographs when I visited, but you can see in the first photograph above just how beautiful the house looked after the exterior was restored. Unfortunately, the house went up in flames like a box of matches. The fire department was there within minutes, but the fire spread too quickly, and the high winds that day were making it even more difficult to put out the fire. 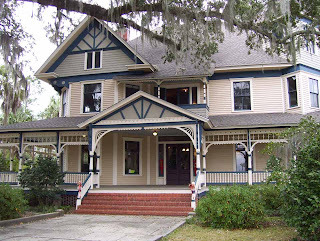 The Valdosta Daily Times has an article about the fire and one about the history of the house. 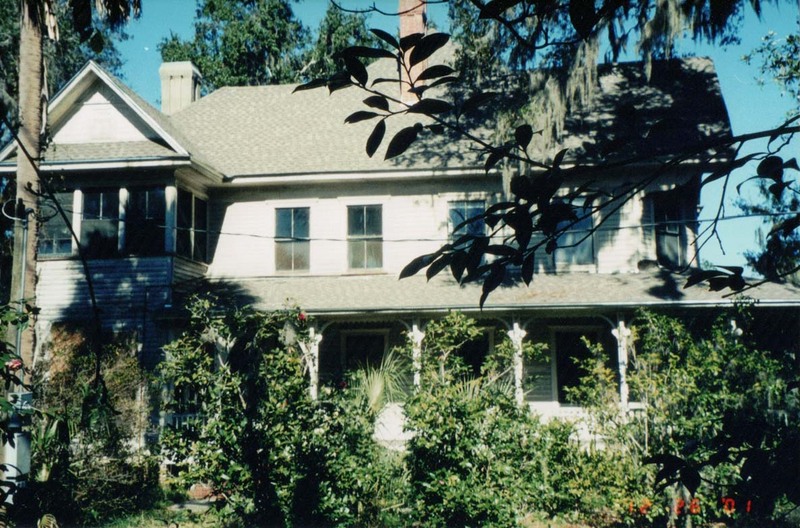 A few months ago, the Valdosta Heritage Foundation decided to rebuild the house, and as of September 1, 2011, reconstruction had already begun. I'm looking forward to seeing what they've done with the place the next time I visit.